Jakarta, December 17: England’s Justin Rose capped a sensational year by signing off with a final round 10-under-par 62 to win the Indonesian Masters by an astonishing eight-stroke margin. The marathon week, where the Indonesian Masters was hit by multiple weather suspensions did not faze the world number six. After completing 10 holes from his third round on Sunday morning, Rose was back at the starting tee in 30 minutes. Rose closes out the year as perhaps the hottest player in the world, with top-10 finishes in each of his final 10 worldwide starts. That stretch includes three victories, as Rose also won the WGC-HSBC Champions and Turkish Airlines Open. He hasn't finished outside the top 10 in a tournament since missing the cut at the PGA Championship. Rose’s lead was never threatened when he surged further ahead with three birdies in his next four holes after making the turn in 29. The Olympic gold medallist dropped a shot on 16 but delighted the crowd at the Royale Jakarta Golf Club by closing with a birdie on 18 for a winning total of 29-under-par 259. It was another second placed finish for Thailand’s Phachara Khongwatmai at the Indonesian Masters after he signed for a flawless 65 while Zimbabwe’s Scott Vincent closed with a 69 to take third place at the Asian Tour season-ending event. India’s S. Chikkarangappa meanwhile secured his Tour card at the expenses of China’s Liu Yan-wei by taking the last 61st spot on the Asian Tour Order of Merit. 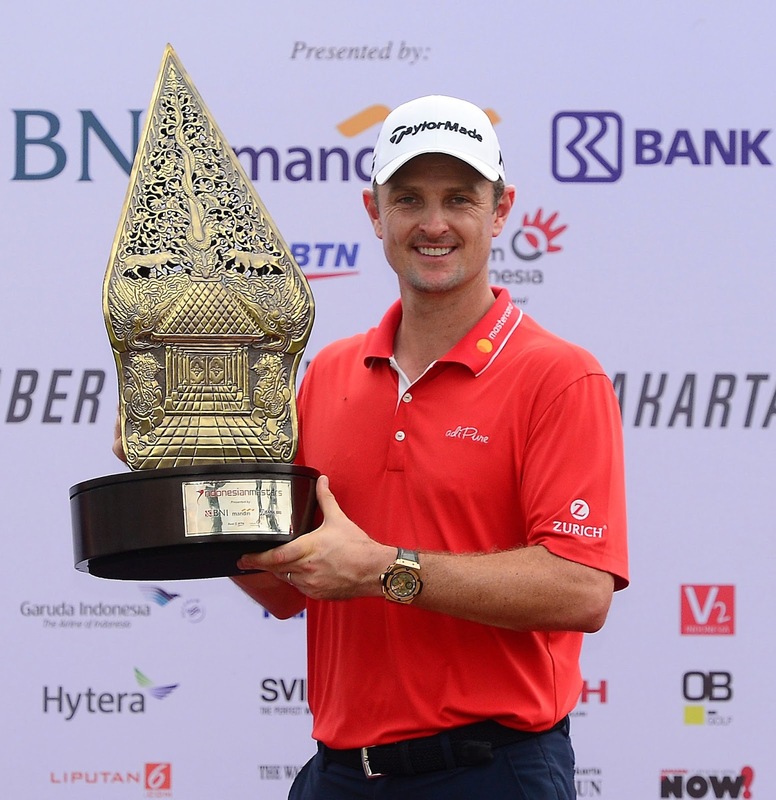 · Justin Rose is the second Englishmen to win the Indonesian Masters after Lee Westwood. Rose was born in Johannesburg, South Africa of English parents. His date of birth is July 30, 1980. · Rose had never won by eight shots in his career previously. It is also the largest winning margin on the Asian Tour in 2017. · The Englishman started and ended the week with a 62, which is the lowest finish by a winner on the Asian Tour this year. · His winning total of 29-under-par 259 is the lowest 72-hole score on the Asian Tour in 2017. India, Indonesia, and Japan - where Asian Tour players can earn a share of a lucrative bonus pool. It is my last event of the season. To finish the year on a good note and still have a couple of weeks to enjoy this win over Christmas and New Year is really nice too. It is the lowest winning ever score (-29) and to win by eight shots, all of that are huge positives. The largest winning margin for me in a tournament, to come here with my game in good shape, have the deal with bad weather and jetlag and stay focused on all four rounds, is something that I am really pleased about. I have had a dream week and I have played incredible golf. 21 under par is very good golf. It has been an amazing week. Couldn’t have asked for a better experience to play with all these amazing guys and players. I didn’t think I was going to come to this tournament in the first place, it was a last minute decision and I am so happy I did. My wife asked me every single day last week to come here and she convinced me when I played well in Joburg last week so I am glad that I listened to her. Justin played some of the best golf I have ever seen. I haven’t got a win yet but I am knocking on the door and, I will just keep doing what I am doing and I am sure it will come soon. Before arriving in Indonesia, I wasn’t expecting a second-place finish to be honest. My plan for every tournament is just to play my own game and not to focus on my competitors. Today, I played really well. But Justin Rose simply played better and rightly won the tournament. I’m very happy with my performances in 2017. Hopefully in 2018, my dream of winning a tournament will come true. I spent two good solid days with Anirban in Ahmedabad before coming to Indonesia and we spoke about keeping positive. That helped a lot because I came out here to enjoy my golf game. That’s what I did on the first three days but I was a bit nervous in the final round because I knew I was on the borderline and I didn’t want it to slip out of my hands. It is very special to keep my Asian Tour card. I was missing cuts after another after a fantastic year. Those things were not working and it was difficult for me to trust what I worked on. I was trying to make my cut. The card was in my mind in almost every event. This season has really made me learned more about my career and what can happen in a golf. I will carry this forward with me and take all these positive with me.